The Equine-Assisted Therapy Workbook gives readers the tools they need to increase professional competency and personalize the practical applications of equine-assisted therapy. Each chapter includes thought-provoking ethical questions, hands-on learning activities, self-assessments, practical scenarios, and journal assignments applicable to a diverse group of healthcare professionals. The perfect companion to The Clinical Practice of Equine-Assisted Therapy,this workbook is appropriate for both students and professionals. "When one thinks of horses, words such as strength and majesty are often considered. Equine-assisted interventions have developed over the past fifty years and are becoming widely recognized as a form of therapy. Hallberg’s book and companion workbook are excellent sources for learning how trained horses with professionals can work together to support the quality of life for many. The books are a must for all interested professionals." Aubrey H. Fine, EdD, licensed psychologist/professor at California Polytechnic State University, editor/author of The Handbook on Animal Assisted Therapy, How Animals Help Students Learn, and Afternoons with Puppy. "This workbook enables the reader to more fully understand the topics addressed in the book through practical scenarios, activities, and other hands-on methods that ensure better comprehension and retention. The book is about the entire industry; this workbook is about the individual reader." 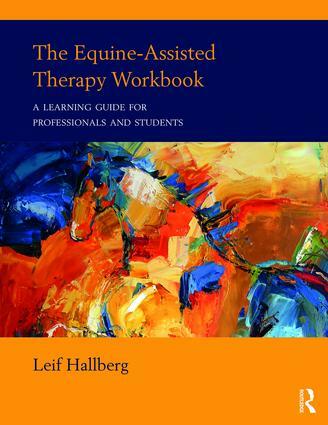 "Leif Hallberg’s The Equine-Assisted Therapy Workbook is the perfect companion to The Clinical Practice of Equine-Assisted Therapy as it provides readers with an informative and thought-provoking resource that addresses the scope, provision, business, ethics, and science of incorporating horses in health care." "This companion to The Clinical Practice of Equine-Assisted Therapy is easy to use and full of opportunities for self-paced, continued learning." "This workbook provides EAT professionals and students with comprehensive theoretical and practical exercises to complement The Clinical Practice of Equine-Assisted Therapy. I love Leif’s books as they provide me with the ‘go to’ texts of EAT for teaching my students; they are thoroughly researched and their layout encourages student growth and progress, not only in their knowledge of EAT but in self-awareness and self-development. Thank you, Leif!" "The Equine-Assisted Therapy Workbook encourages readers to think and rethink their methodology, ethics, terminology, education, and practice. The workbook is written in an objective way, stating Leif Hallberg's true understanding of EAT with all the twists. Hand in hand with the workbook goes the Clinical Practice of Equine-Assisted Therapy, which targets the differences between the branches of EAA/EAT. Both the book and the workbook can be utilized internationally in teaching and self-learning."